March 05, 2018 – ELAINE SCHATTNER, M.D., M.A. March 01, 2018 – MIKE HENNESSY, SR.
March 10, 2018 – DEBU TRIPATHY, M.D. New drugs bring advancements to acute myeloid leukemia after 40 years. 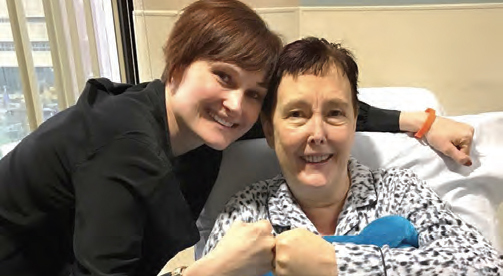 The biggest battle of Kathleen Packard’s life began in late 2016 with sudden severe pain in her abdomen. The 59-year-old resident of Amherst, New York, couldn’t remember the last time she had been sick, but this kind of stomachache warranted a trip to the hospital. The doctors discovered that Packard had pancolitis, a severe form of ulcerative colitis that had spread throughout her large intestine, and ordered a blood test. From there, her life took an unexpected and tumultuous turn. Wang, M.D., chief of the Leukemia Service at Roswell Park in Buffalo, New York, diagnosed Packard with acute myeloid leukemia (AML) and started her on treatment the very next day. In patients with AML, the bone marrow makes abnormal malignant blood cells such as myeloblasts (a type of white blood cell), red blood cells or platelets. It is one of the four main types of leukemia. The American Cancer Society estimates that in 2017, there were 21,380 new cases and 10,590 deaths from AML. Although AML can occur in children, adults aged 45 years and older are generally most susceptible. The disease is slightly more common in men than in women, but the average lifetime risk for both sexes is less than half of 1 percent. A bone marrow sample at diagnosis confirmed that Packard had a subtype of AML characterized by a mutation in the FMS-like tyrosine kinase 3 (FLT3) gene, which plays an important role in blood-forming stem cell survival and proliferation. About 1 in 3 patients with AML has this mutation, which may be associated with a particularly poor prognosis. But Wang offered Packard hope through participation in a clinical trial for a new drug specifically targeting FLT3-mutated AML. Patients with AML are typically treated with two phases of chemotherapy: induction and consolidation. Induction involves treatment with the chemotherapy drugs cytarabine and daunorubicin. Consolidation chemotherapy occurs after remission — clearance of malignant leukemia cells in the marrow followed by regeneration of normal marrow blood-forming cells — to help prevent a relapse and usually includes high doses of cytarabine, often followed by an allogeneic stem cell transplant. In January 2017, Packard had an allogeneic bone marrow transplant from an unrelated donor. Today, she remains in remission and recently restarted maintenance therapy with crenolanib as part of another clinical trial. Packard represents one of countless patients who have benefited from a growing number of treatment options for AML. After 40 years of little to no improvement in higher remission or cure rates since the advent of cytarabine and daunorubicin, four new agents were approved for AML by the Food and Drug Administration (FDA) in 2017 alone: Rydapt (midostaurin), Vyxeos (CPX-351), Mylotarg (gemtuzumab ozogamacin) and Idhifa (enasidenib). Several other promising drugs, such as crenolanib, are still in the pipeline but expected to gain approval in the near future. More treatment options will translate into better outcomes for patients, because oncologists can figure out which of several agents will work best for a given individual. For instance, through a bone marrow sample, Wang found out at diagnosis about Packard’s FLT3 mutation and gave her a targeted drug. The sudden bounty is the culmination of AML research and knowledge that built up for decades — patient genome sequencing, identifying new mutations and understanding their consequences, performing clinical trials, and so on. The discovery of mutations that characterize subtypes of AML led to more personalized treatment options that could outperform the standard regimen. Typically, about a quarter of adults with AML can be expected to survive three or more years and may be cured. But a number of factors, such as advanced age, systemic infection at diagnosis, elevated white blood cell count, central nervous system involvement with leukemia and certain genetic mutations, lead to poorer outcomes. Factors that increase a person’s risk of AML include advanced age, being male, previous cancer treatment with certain chemotherapy drugs, exposure to radiation, smoking, toxins (some solvents, for example), other blood disorders, genetic syndromes and family history. Signs and symptoms in the early stages of AML, such as fever, bone pain, fatigue, shortness of breath and pale skin, can mimic the flu or other common diseases. Because it doesn’t usually form tumors, AML is not staged the same way other cancers are. Instead, lab tests determine subtypes and a patient’s outlook. The French- American-British classification divides AML into subtypes, M0 to M7, based on the type of cell from which the leukemia develops and how mature the cells are. An updated classification by the World Health Organization separates AML into several groups by considerations such as the presence of certain genetic abnormalities, disease related to previous chemotherapy or radiation, and disease related to blood disorders. To that end, two of the new agents target subtypes of AML characterized by specific genetic abnormalities. In April 2017, the FDA approved Rydapt for the treatment of adults with newly diagnosed FLT3-positive AML in combination with standard two-phase chemotherapy. The phase 3 RATIFY trial randomized 717 patients with AML who had the FLT3 mutation to standard induction and consolidation chemotherapy plus Rydapt (360 patients) or placebo (357 patients). Median overall survival was 74.7 months with Rydapt versus 25.6 months with chemotherapy alone. Four months later, Idhifa was approved for treating patients who have relapsed or refractory isocitrate dehydrogenase 2 (IDH2)-mutated AML based on the promising results of a phase 1/2 study. The IDH2 gene encodes for metabolic enzymes found in mitochondria, the energy- producing centers within cells. The single- arm, multicenter clinical trial included 199 adults with relapsed or refractory AML who had an IDH2 mutation. They took the oral drug daily, and 19.3 percent experienced complete remission with a median duration of 8.2 months. Common side effects of Rydapt include low levels of white blood cells with fever (febrile neutropenia), nausea, inflammation of the mucous membranes (mucositis), vomiting and headache. Idhifa’s side effects include nausea, vomiting, diarrhea, increased levels of bilirubin (a substance found in bile) and decreased appetite. In August 2017, the FDA approved Vyxeos, a repackaged formulation of induction chemotherapy drugs cytarabine and daunorubicin, for two subtypes of AML with typically poor prognoses. Therapy-relatedAML occurs as a result of specific types of chemotherapy or radiation, and AML with myelodysplasia-related changes is characterized by a history of certain blood disorders and other mutations within cancer cells. Vyxeos combines the two drugs into a single formulation encapsulated in liposomes. In a clinical trial, 309 patients newly diagnosed with one of the two AML subtypes received either Vyxeos or separately administered treatments of daunorubicin and cytarabine. Those who received Vyxeos had a median overall survival of 9.56 months versus 5.95 months for patients who received the two drugs separately. Side effects of Vyxeos include hemorrhage, febrile neutropenia, rash, swelling of tissues, nausea, mucositis and fatigue. Lastly, anti-CD33 antibody drug conjugate Mylotarg received approval in September 2017 for adults with newly diagnosed AML whose tumors express the CD33 antigen. The drug combines an antibody with chemotherapy to attack tumor cells with CD33. It was originally approved in 2000 but voluntarily withdrawn from the market after several early deaths and lack of evidence of efficacy. The agent has a new dosing regimen that has been shown to be more safe and efficient. A randomized phase 3 trial, ALFA-0701, compared daunorubicin and cytarabine with or without the addition of Mylotarg in 271 patients with CD33-positive AML. Those who received Mylotarg had a median event-free survival of 17.3 months compared with the control group’s 9.5 months. However, no significant improvement in overall survival was seen with Mylotarg. Severe side effects of Mylotarg include low blood counts, infections, liver damage, blockage of veins in the liver, infusion-related reactions, and severe bleeding. In the clinical trial, patients who took Mylotarg were seven times more likely to experience side effects compared with those in the control group. “These are exciting times, but with that excitement comes questions,” Medeiros says. “All of these agents were tested in isolation of one another, so it’s going to be a challenge for us to learn how to use and combine these agents. Last year brought many new possibilities in the treatment of AML, and it appears 2018 does likewise. Specifically, Medeiros says ivosidenib, an IDH1 inhibitor that targets IDH1-mutated disease, has a good chance of hitting the market early this year. It was submitted to the FDA in December following phase 1 trial results that showed a complete response or complete response with partial hematologic recovery rate of 30.4 percent, which lasted for a median duration of 8.2 months. Another potential target is B-cell lymphoma 2 (BCL-2), the protein that makes cancer cells resistant to therapy. BCL-2 inhibitors have shown promise for patients who aren’t good fits for induction chemotherapy, such as older adults. Venclexta (venetoclax), previously approved for patients with chronic lymphocytic leukemia, recently demonstrated a complete remission in up to 50 percent of patients aged 60 years or older with relapsed or refractory AML. In a recent study conducted by Wang, crenolanib combined with chemotherapy saw very high response rates of over 80 percent complete remission or complete remission with incomplete hematologic recovery. While most FLT3 inhibitors bind only to the receptor in its inactive configuration, crenolanib can bind for FLT3 in both active and inactive configurations. Packard says she owes her survival to Wang and other members of her care team at Roswell Park who are willing to take a chance with new therapies. She takes crenolanib in pill form three times a day, every eight hours, which disrupts her sleep schedule and normal routine. But her main objective is survival, and although the treatment has been tough, she feels grateful to be alive.